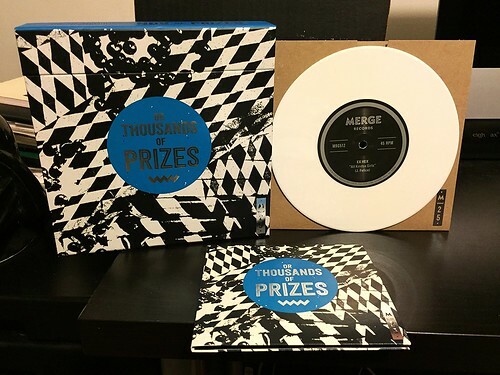 The last 7" in the Or Thousand Of Prizes series from Merge is a split 7" between Ex Hex and Twerps. Ex Hex is a band that I am somewhat familiar with. I had seen the Mary Timony fronted band open up for Rocket From The Crypt last year. While I did enjoy them, it wasn't to the point where I felt that I wanted to pick up one of their records. I'm pleasantly surprised with how much I like their contribution, a cover of The Real Kids' "All Kindsa Girls." It's tremendously catchy in a garage-y Ramones sort of way. Just a really fun song. Twerps, on the other hand, is a band that I'd never heard of before getting this 7". Their song "Science" is pretty good. It leans towards the indie rock side of the spectrum with muddy production, but strong harmonies piercing through the fog. It has a distinct 90's sound, but I'm having a difficult time really pinning it down. It mostly reminds me of Cub or Go Sailor, but not nearly as in-your-face upbeat and energetic. I actually like this song a bit more. I'll have to check out more of their records as I was pretty intrigued by this. Since this is the last of the series, I've also taken a picture of some of the bonuses. It comes with a nice, sturdy box set to hold all of the singles. They also sent along a CD of every song in the series (I nice bonus since the 7"s didn't have MP3 download coupons). I also got a Merge shirt and another bonus 12" of Merge bands covering other Merge bands (That's a review for another day). For the money, the quality of these records is really worth it. Merge handled this like champs. The records always came out on time and the extras were really cool. Musically, I can't say this series thrilled me as a whole. Though I was really into Superchunk, Mikal Cronin, King Kahn and a few others; for the most part this just seemed like a box set of mid afternoon NPR bands. I wish there were some more bands with a little more oomph. Still, it's hard to complain about this series as it was just presented so flawlessly. Kudos to Merge. The Ex Hex song is a Real Kids cover.